We try to exceed customer expectations and provide maximum opportunity in changing the job board site script to own requirements through the back-end. With the help of an integrated designer tool, you can generate a new color scheme for your website at a click of a mouse. Red, blue, light or dark - you decide! No programming knowledge required. No need in any template integration. Feel like a designer! 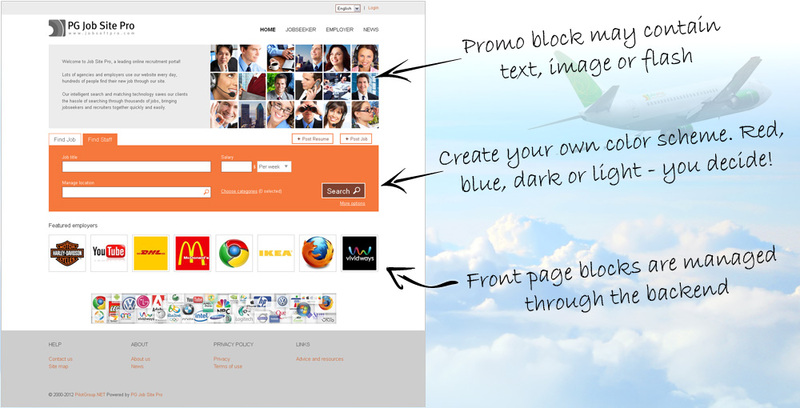 Dynamic blocks is a great tool to manage the content of your site front page. Choose blocks that will be displayed on your site. There is a variety of options: search form, promo (text, image or flash), featured employers, jobs by categories, site stats, latest added jobs or vacancies. The fields of vacancies, resumes and advanced search form can be easily customized. You can add text, text areas, drop-downs and checkbox fields. Create as many custom fields as you need. There are a lot of reference fields in resume and vacancy. You can customize them per your requirements: add, edit, change sequence or delete.